This beautiful single story pool home has great views of the PGA West Citrus Golf Course. 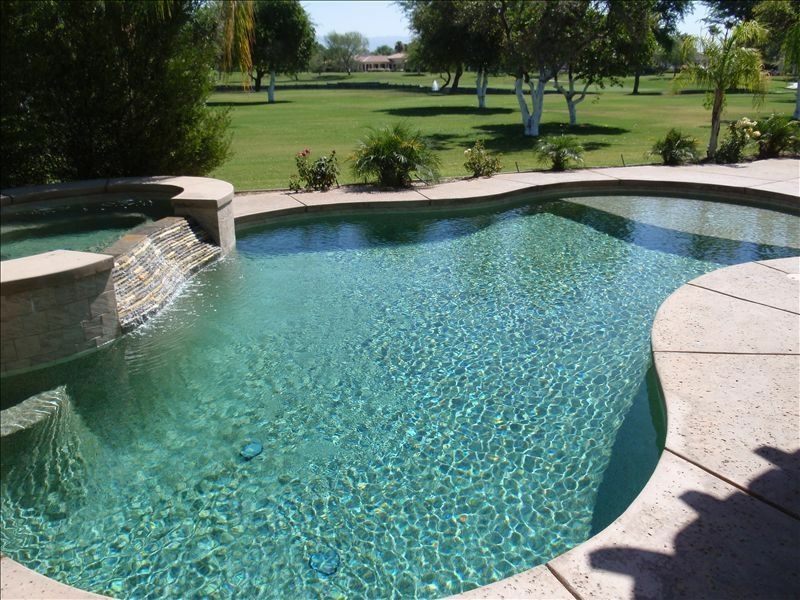 Enjoy the new pool and spa with great views with over 80 yards from the golf action for privacy. This home has two master suites each with their own fireplace. A great room off the beautiful gourmet kitchen. The back yard has a new pool and spa, built in BBQ, fire pit and the front yard has a private courtyard. This home has four bedrooms, each with their own LED Television. Both masters have California King size beds, the other two bedrooms have queens. The family room has a wall of windows that opens up to the backyard. There is a big screen with surround sound system. Cruise the gate guarded Citrus Country Club with the 4 seat Golf Cart provided. There are also 4 cruiser bikes to explore the Country Club grounds, pick fresh lemons, oranges and grapefruit that are abundant at the Citrus. Old town La Quinta is about a mile bike ride away, there you can have breakfast or lunch, drinks, ice cream and shopping at several local shops. There is a brand new fire pit that sits just outside the pool. Have been an owner in the Coachella Valley since 1993. Born and live in Orange County California, love to gold the Coachella Valley. Father of three who all love the desert house and the getaway it provides. This property is behind the gate of a beautiful golf course community with golf course views while being private. The property is directly accross the street from the new Silver Rock Golf Course which is home to the Bob Hope golf tournament. This course is affordable and public. If you are a golfer, there are dozens of golf courses all around you in the La Quinta Area. The new Silver Rock public golf course which was home to the Bob Hope Desert Classic is directly accross the street. Large master bath with walk in shower, jet tub.